This is your chance to WIN a personalised baby blanket from Charlotte Cot Blankets! 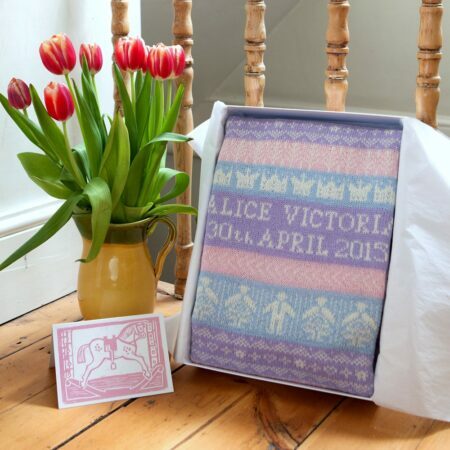 The prize is one of my popular personalised cotton pram-sized blankets, worth £88. The winner will be able to choose from the range of cotton baby blankets at Charlotte Cot Blankets. 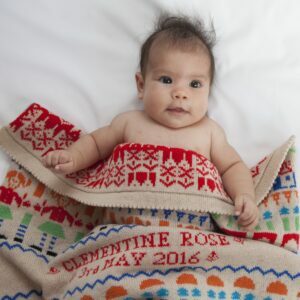 My personalised baby blankets make a very special gift for all babies, including royal ones! 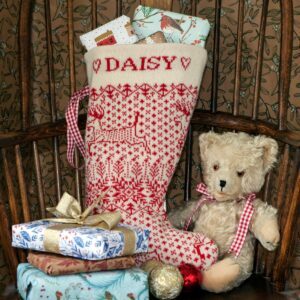 Each one is individually made in my studio in Norfolk, England. 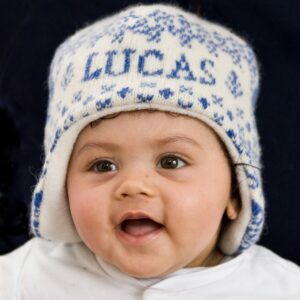 Baby’s names and date of birth are knitted as part of the blanket – making each one unique. With the Duke and Duchess of Cambridge expecting their third child this month, I’ve been wondering which names the royal couple will choose for their new baby. The bookmakers’ top choices at the moment are Mary, Alice or Victoria if the new royal baby is a girl, and Albert, Arthur or Frederick if it’s a boy. I think older names, from my parents’ generation, are making a comeback – Norman names such as Isabelle, Eleanor and Mathilda or John, Robert and Richard. What do you think? I’d love to hear! To enter the competition, let me know your royal baby name suggestion in the comments. A winner will be chosen at random, after the new royal baby is born. Please don’t worry if your comment doesn’t show up straightaway, it has to go through the spam filter first. The prize is a cotton pram personalised baby blanket worth £88. To enter, leave a comment on this post. One entry per person, please. The winner will be selected, at random, once the new royal baby is born. We will contact the winner via e-mail. If we do not hear from the winner within a week, a new winner will be chosen, again at random. I think the royal baby’s name will be Victoria Alice if a girl, and Henry, James if a boy. I think it’ll be Henry if a boy and Grace if a girl! I would love to think they would go with Matilda Rose for a girl and Albert James for a boy. What a lovely competition…… I think James for a boy and Victoria for a girl. Fingers crossed….. such beautiful blankets! I think it will be a girl, & I’m going for Victoria Louise! If a boy, I think Albert Phillip. I think it will be Alice if it’s a girl and Robert if it’s a boy. I think it will be Alice for a girl and Henry for a boy. Victoria or Albert. Just love classic names. Fingers and toes crossed. My baby is due in in the autumn and my first little prince loves his special blanket made by you. If it is a boy James, just like my new baby. If it is a girl Alice. I think Rupert James is a lovely name for a little boy, or Alice Rose for a girl. I’m thinking Victoria for a girl and James for a boy. It’s lovely seeing traditional names making a come back, my daughter is Anna Victoria, something nice that hopefully will never sound out of date. So many lovely names but I think Grace or Alice for baby girl and Henry or oliver for a boy. I think Victoria for a girl and James for a boy. I’ve always liked the name Kylie, this would be a lovely choice! I am due in 34 days and our baby girl is our rainbow baby I would love to win this blanket to wrap her in for our longed for cuddles! I think the royal baby will be called Olivia Carole from the maternal side and potentially Arthur Michael when reviewing William and Charles middle names and potentially seeing a pattern! Charlotte Elizabeth Diana – acknowledgment has already been made to her grandmother and great grandmother on the paternal side so thinking it could go maternal?